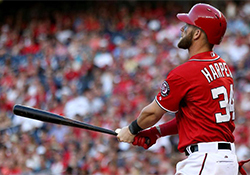 When Bryce Harper went "only" 2-for-4 with a booming RBI double on Sunday against the Braves, it snapped his string of consecutive games with a home run at three. That's not an especially long streak, but Harper's six homers over that time put him only one shy of the Major League record. While Joe DiMaggio's 56-game hit streak is one of the best-known numbers in all of sports, homer streaks don't share quite the same prestige -- and reside only in the realm of single digits.